Any Food52 member is welcome to help us test our Community Pick candidates, so go call dibs on the recipe you'd like to test in the comments section below! We'd love to see some new testers in the mix. Don't forget to email us your notes (about 100 words) to [email protected] by next Tuesday at 5pm (EST). We'll collect your comments, decide the official list of Community Picks and publish your evaluation in the headnote if the recipe is selected as an Community Pick (with credit, of course!). And even if the recipe you test isn't chosen as an Community Pick, please feel free to leave your testing notes in the recipe's comments section. Constructive criticism is always encouraged! Beef Chili with Beans and Beans, if it's still available. 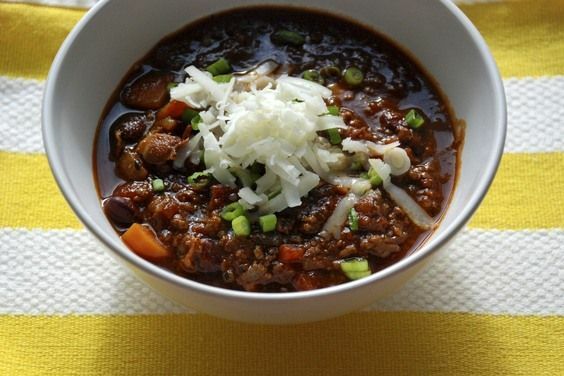 Cowboy Coffee Chili Mac, and Beef Chili with Beans and Beans are still up for grabs! Unfortunately, I am not around this weekend, so I am unable to test. :( But all of these chilis look fabulous -- I look forward to trying them. Congrats to all of the CP candidates! If I'm reading this right, Ginger's Lamb Vadouvan Chili is still available? Gotta go with the bean-free chili, if I may!! You got it, wssmom! Enjoy! We're traveling all weekend so unfortunately I won't be able to test anything this round. They all look marvelous though, and congrats to all! Research Chili for me, please! Thanks for testing; I hope you like it! I can test the Almost Meatles Butternut Squash and Black Bean Chili. Thanks for testing AnnP! Hope you enjoy it!! I call the Black Bean Tomatillo Chili! When do you need our comments by? That recipe has already been claimed. Is there another one you'd like to test? Oh bummer -- just saw that down at the bottom. How about I try the Spicy Chicken and Sausage Chili? And again, when do you need us to try it by? They prefer to get the comments by Tuesday evening at 5 Eastern time. Hey fearless, hardlikearmour is exactly right! All the details are in the post right above the recipe links. Happy testing! I will take Diamond Mountain Chili from D.
Forgot to say please. I am just so thrilled I got here in time to test! Been too late past testings. Congratulations to all CP’S winners! Congrats to all! I will check back after work and see if any recipes are left to test. Wish I could test this week, but I'll be traveling too much! Congrats to all the CPs this week, and thanks for the pick! Welcome to Community Picks testing! Unfortunately, that recipe has been claimed. Is there another one you'd like to test? Black bean tomatillo chili, please.